This was the conversation between Sam Heughan’s Jamie and Scott Kyle’s Ross during the closing episodes of the second season of Outlander. When at last all seemed lost, Jamie ordered Murtagh to set the Lallybroch men on the road away from the battle, before facing his own fate on Culloden Moor, with Murtagh by his side. Outlander fans now await season 3, knowing that Jamie and Claire will be reunited, albeit some 20 years (or 220 years) later. But what they don’t know is the fate of the other highlanders. Throughout season 2, certain changes were made from the book to the screen and it remains to be seen what may yet happen to the loyal men of Lallybroch. Given that Jamie was a man of his word, there is no doubt that Ross and the others would have been led away from the battle - but did they actually get to safety? Or did they end up on Culloden Moor too, despite everyone’s best efforts? And if so, did any of them survive? It’s certainly something that actor Scott Kyle, who portrayed Lallybroch crofter Ross in the second half of season 2, has wondered. 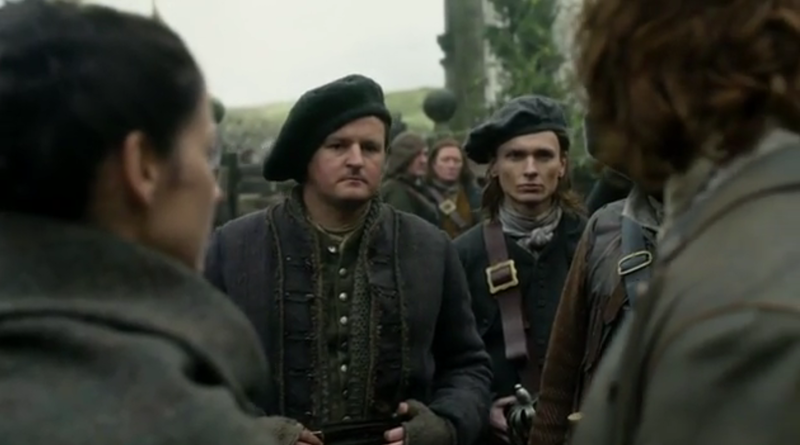 It was Ross who formed a friendship with Rupert after Angus and Kincaid were killed; Ross who met Jamie and the others in the old church following the British ambush and Ross who was sent to bring Jamie to Lord Murray, unaware that he was interrupting Jamie and Claire’s desperate discussions about stopping Charles Stuart once and for all. The character was developed far more for screen than in the books and since his first appearance, Ross fan art and merchandise has been regularly posted on Twitter. Fans are also supporting Scott Kyle’s theatre, Bathgate Regal and the inevitable questioning has begun - will Ross appear in season 3? It’s a question that Scott Kyle cannot answer as yet, but the actor has stated that he is definitely available to reprise his role if asked. Perhaps a #SaveRoss or a #Iwillseeyousafe campaign would be one way for fans to pass the time during the latest “Droughtlander”! in the book claire gave a list of lallybroch men to roger to research re whether or not they survived. will have to check for ross the next time i get to that part again. Ross was a Lovett and the men on the list were Fraser. Ross wouldn't be on that list. We #Kylanders & #Scotts Kylanders have already started a #saveRoss campaign. Scott went from a few hundred fans to 39K almost overnight and Diana Gabaldon has gotten the word that we want our Ross back. Keep sending out the word! Yes, let's do the research! Save Ross! !